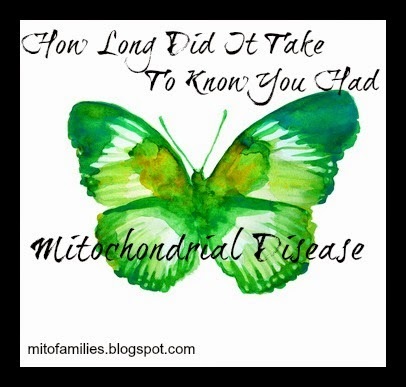 How long did it take to know you had mitochondrial disease? How we found out we had mitochondrial disease is a loaded question. There were clear signs for years but medical science had not caught up with the disease. My hubby and I after lots of prayer and thoughtful discussion with our mito drs decided that a muscle biopsy would not be in the best interest of the kids. The whole family was placed into the 'suspected mitochondrial disease' category. So we waited…. 7 years. During those year all sorts of other medical issues were ruled out. From the simple with an odd presentation to the weird genetic outliers. We went to see a second opinion at a huge hospital with a great reputation. He agreed that we just needed to treat what we saw and wait. After several years being followed by a mitochondrial specialist and with labs and presentation all pointing towards mito we were put into the 'probable mitochondrial disease' category. Then we were told about a research opportunity that our family of 6 affected would be perfect for. We all had a cheek swab. It was one of the simplest test we had ever taken with no pain. Swabbed the inner cheek put the samples on dry ice and shipped them away to Philadelphia. Then one hot June day while I was preparing to speak at a conference my husband called to say we got the results. ALL of us were so depleted in complex 1 and 3 that it was assured we had mitochondrial disease. The dr had us ALL redo our testing to be sure of the results. The repeat tests were the same. We have mitochondrial disease. Finally a diagnosis. With those results in hand our mito specialist was able to order more specific results. We were immediately put into several research groups given the size of our family and the tight grouping of our symptoms. Now for those that don’t know research testing is for the DOCTOR'S education not yours. If you are lucky you will get results but they come back on a scholars pace if at all. One test has been out 3 years. Private testing which has blossomed into a lower cost patient based industry is much more responsive. We have had testing through private genetic labs and the testing was back rather quick, never as speedy as they told us, but still timely. Here we sit 9 years later with a diagnosis of mitochondrial disease. No it does not have a specific name just a long tangled set of letters and numbers. Connections to specific complex deficiencies. And frankly questions attached. The world of genetic testing is opening up and becoming a wonderful way to diagnosis and help us all dealing with genetic diseases. The down side is there is SO MUCH information flooding the doctors right now that it can be difficult to glean what is important and what is not hurting your health at this time. Each person and family with mitochondrial disease has to travel this long arduous diagnostic period (at differing speeds.) You can be relegated to that horrible land of ‘probable or suspected mitochondrial disease.' Suspected means there are several other possible options that must be looked into but mito should not be ignored. Probable generally means everyone thinks you have mito but they just don’t have a specific lab or they are not willing to diagnosis on clinic means. That leaves you struggling every ER run with doctors that don’t believe you. That means that you don’t fall into research testing or treatments. I HATED that 7 years of limbo land. While I did not want to have mito, we do. Since we do I want to be clearly diagnosed and now we know what we are fighting. Now I want the whole medical team from the kids to my adult team to work as hard as possible to keep us stable if not progressing! Mito will never win. I choose to not allow that. It might hurt my body but it will never hurt our spirit! Dear Resident if you are in over your head, we understand, just own up to it rather than try to bluff through. This is a TEAM effort if you can't deal with that pass this room. Recently I was in the hospital and vlogged while there about how I was working to advocate for myself and my complicated medical situation. Staying as healthy as possible is our goal! How do you help keep your hospitalizations on task and working toward a mutual goal of health and stability? I was planning on writing this series but not from the inside. Yeap. I am in the hospital having problems with blood infections. My mito body doesn't respond well to many strong medications and the bouncing back to healthy is slowwwwww. Skype, FaceTime keep a visual contact going with your loved ones. If you can have people stop in. Be sure all understand no one that even thinks they might be ill and only for a short time. Most hospitals now have a way you can send Ecards. Give your mito friend a Ecard shower! If your mito friend is religious and very traditional do your very best to in some way bring that tradition to them! If like me you have little ones that are too small to come in video them walking through the house showing you what all they did for Christmas. A video of the morning and wrapping flying through the air will help heal an aching heart. Now with Amazon Prime you can also send your mito friend Christmas shows via online download (if the hospital has the capability). Christmas is not about the stuff. The stuff DOES help a person trapped in a beige room with little to no connection to the outside. Also a mito warrior that is awake at odd hours and minutes. Having something in hand will help them focus and know that they are loved. Merry Christmas fellow Mito Warriors and Mito Families! 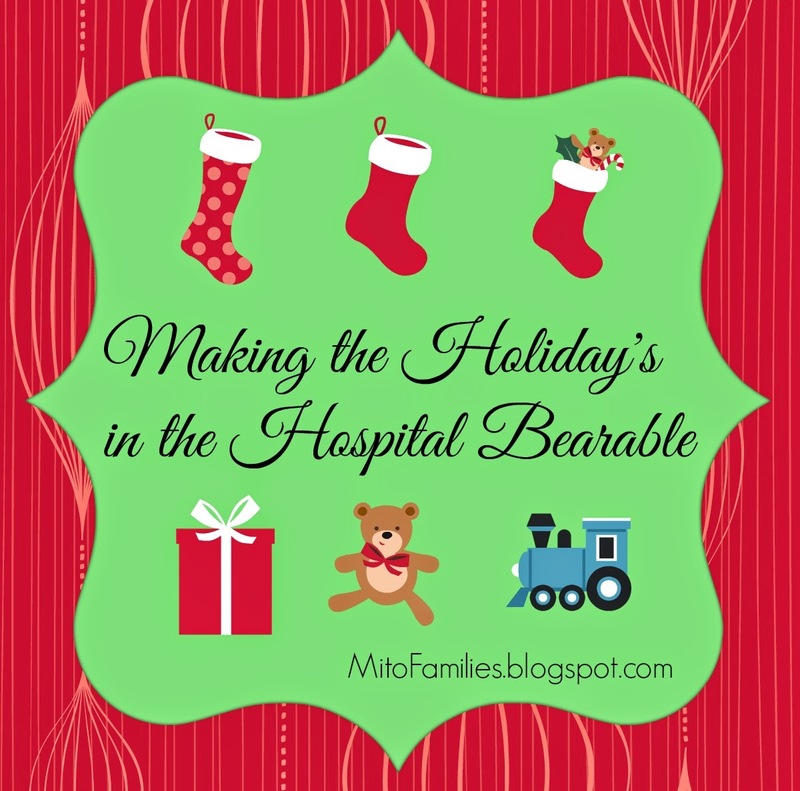 Feeding Tubes and the big Holiday Meals! Holiday meal fun when you can’t eat! When I was using a G-tube and J-tube for getting nutrition I wanted a fun way to incorporate it into our holiday. I also didn't want a child in the same situation to feel like they needed to go sit in another room so others would not feel uneasy. 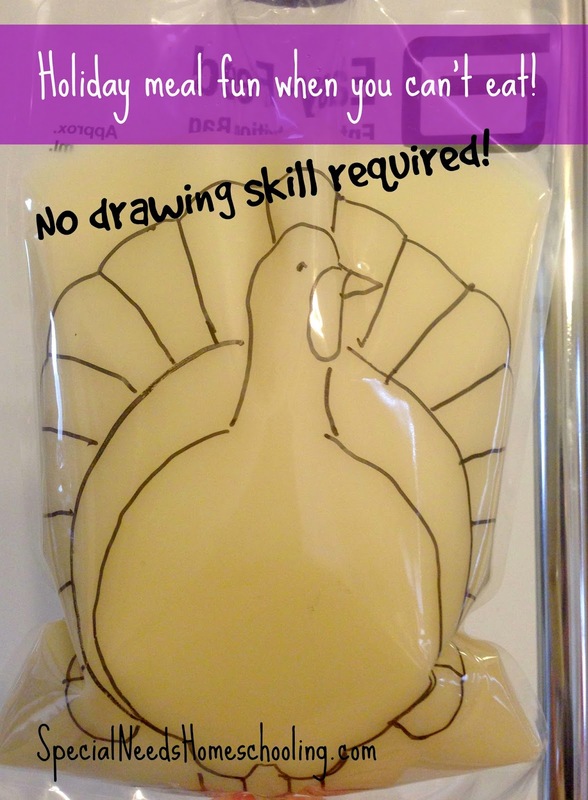 I had fun with my feeding tube bags and the results is pure fun for all! 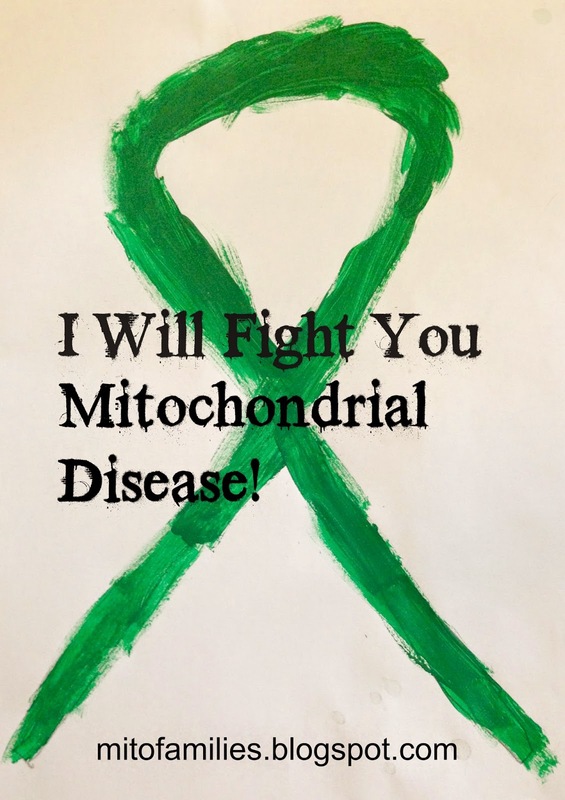 I Will Fight You Mitochondrial Disease! When I was in high school I was that student that was teased because she did everything. I got tons of certificates and awards. I was training for the Olympics on the side. I am NOT the cheerleader rah rah type but I was known. After high school I kept my training up. I traveled the US shooting at competions from Canada, the US west coast to the east coast and I was good. I didn't know anything about mito back then. It was just me starting a new life as an adult. A few life issues happened and I joined the Navy. The Navy was a dream of mine. My family for generations has been in the military protecting the country. Now I was part of this legacy! In bootcamp I struggled with the running portion of the training. I also found that unlike my fellow shipmates I was not getting better I was starting to slide and not be able to do as many push ups as I could do the day before. I got an infection in my feet from my Boon Dockers (Navy issue boots ugh!). Little things kept cropping up but again it wasn't enough to cause concern. But that island life had a high price for me. I was hot and humid constantly. I couldn't get away from it. The hard manual work I had to do was usually out in that heat and humidity. It hurt. I began aching constantly. Then training for our annual physical review happened. Soon after starting that training on top of my normal hard schedule I passed out. I kept passing out. The hospital tried to help me with IV fluids but that didn't stop my body from crashing. I now believe that was a mito crash. I crashed so hard that after months in the military hospital I had to get a medical discharge from the military and sent home still ill. I walked into the Navy and wheeled out. Mito has taken a lot from me over the years. Mobility. Jobs. Friends. Some family. Now it is taking my hair, nails, and teeth because of extreme malnutrition. My body is not absorbing nutrients even through TPN. It's like by body doesn't know what to do with them. Mito is a thief. Whether things are slipping away silently or in a huge way like a mito crash that lands you in the ICU. It takes and takes and takes. Mito has changed me. And I hereby draw the line in the sand. Mito you will have to work hard to take another thing from me, my lovely kiddos, or my mito friends. I will fight you every step of the way. Helping research. Raising awareness. Talking to drs and other medical professionals across the country to bring awareness to mitochondrial disease and the need for a TREATMENT and CURE! Mito Families! is my baby and I spend most of the time on Social Media with it. Helping to keep a supportive and I hope informative place for those dealing with mitochondrial disease. 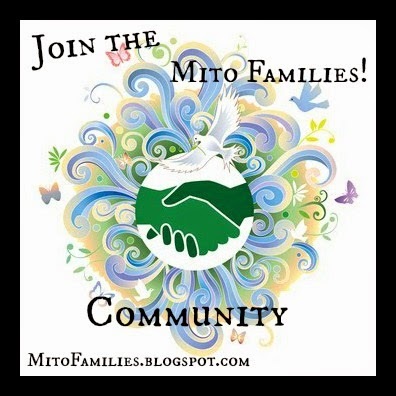 2- Facebook Main Group Mito Families! 5- Instagram SpecialNeedsHomeschooling this is window into our everyday life which of course includes mito. I hope that you come and enjoy some of the social media options. Make friends and find out that you are not alone. Mitochondrial disease may have a strong hold on us but it does not define us! Looking for some books to help you or your child understand mito? Here are some great deals I found on Amazon. First lets start with FREE! Hello! I am a mom of 5. Writer, speaker, and patient advocate for those with mitochondrial disease. I have mito as do my precious children. I am passionate about helping others homeschool, fight mito, and find peace in their home. Helping you create a hope-filled Haven!